Your Interstitium is the Ultimate Anti Aging Serum! Our interstitium contains Hyaluronic Acid (water for your cells) and various proteins and sugars (food for your cells), making it the best anti aging serum ever! Every cell in our body has an interstitium, which is a latticework of collagens & elastins in combination with the extracellular matrix (ECM). Our interstitium provides structural and nutritional support to the surrounding cells. 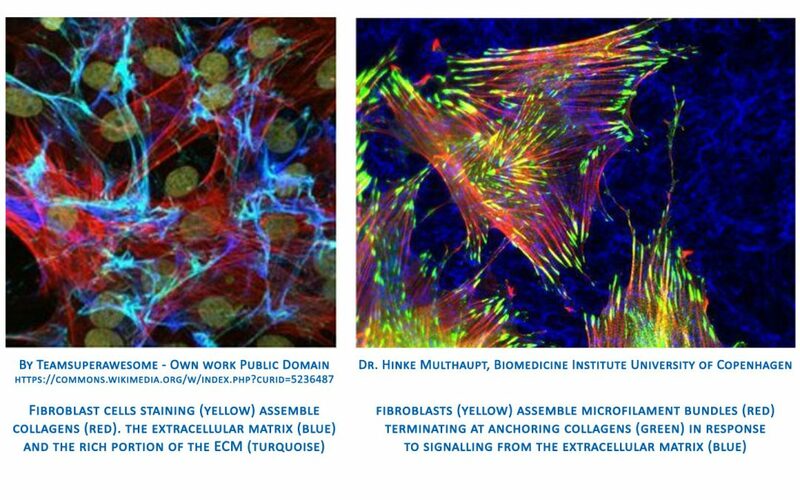 The ECM is a collection of extracellular molecules secreted by fibroblast cells. This interstitium is continuous throught the body, from skin to bone in varying degrees of viscosity. For example, the interstitium of cartilage is thicker and denser than that of skin. Amazingly, our interstitium is fractal. This means the interstitium is a repeating pattern of continuous architecture with differentiated “specialties”. Or said more simply, from skin to bone, we are one connected whole being. This is why I like to say “healthy skin is bone deep”! Check out the amazing visuals of our interstitium by Dr. Jean-Claude Guimberteau, www.EndoVivo.com. Over time, our interstitium becomes less populated with the optimal food and water needs of the surrounding cells. This happens due to a decrease in cellular energy, environmental factors and lifestyle choices. Which is why I recommend supplementing with amino acids and hyaluranic acid. Supplementation can be oral and/or topical, such as an anti aging serum like Rehabilitation Serum. Supplementation can repopulate the ECM and interstitium with the needed food and water to boost your regeneration potential of all tissues, including skin!